Our superb Westbound transatlantic crossings depart in October and November. Whichever you choose, a traditional voyage under sail from one continent to another is sure to be a memorable journey. The magnificent 5-masted Royal Clipper leaves Lisbon for a 16-night journey to Bridgetown and takes in the fishing port of Safi in Morocco and the popular island of Tenerife, dominated by Mount Tiede. There is also a call at picturesque Portimao in the western Algarve. The facilities and service on board the Star Clippers fleet ensures you an enjoyable Atlantic voyage. The furnishings are elegant and the easy-going atmosphere is helped by open-seat dining and no requirements for formal dress. Embark Royal Clipper in Lisbon. Portimao makes a great base from which to explore the extensive history of the western Algarve, including Lagos which was the heart of Portugal’s 14th-century age of exploration and Silves which was the Algarve's ancient capital. Enjoy the facilities on board during a day at sea. Today, Safi is home to a fishing port and a lively old town where you can buy traditional regional pottery. It is also the gateway to Marrakesh. This is Royal Clipper's last call before her Atlantic crossing. The island is overlooked by Mount Tiede and its steep volcanic mountains are bisected by valleys rich in flowers and vegetation.The anthropological museum gives a fascinating insight into the stone age Guanche people. 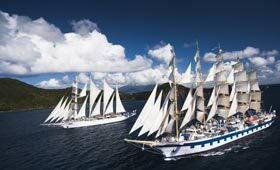 With a complement of 42 sails on its 5 masts, Royal Clipper reflects the grand age of sail, but with state-of-the-art navigation systems and every comfort and luxury. Enjoy the transatlantic crossing on Royal Clipper - an authentic sailing experience. Disembark Royal Clipper in Bridgetown. Embark Star Flyer in Las Palmas. San Sebastian is the picturesque capital of the island of La Gomera. Its historic centre is home to beautiful plazas and an array of colourful buildings. Christopher Columbus stopped in San Sebastian on his way to the New World and you'll be able to find out a lot about the famous explorer. Enjoy the thrill of an Atlantic crossing on genuine sailing ship, Star Flyer. This is a unique once-in-a-lifetime experience. Disembark Star Flyer in Bridgetown. Save 20% on 2020 departure PLUS exclusive £50pp discount on all departures!